Scooper - Story News: The Biggest Burger in the World--1774 Pounds! The Biggest Burger in the World--1774 Pounds! Each year, Americans eat just shy of 50 billion hamburgers. Reigning Nathan’s Hot Dog Eating Champion Joey Chestnut set the world record for most hamburgers consumed in eight minutes back in 2007. He inhaled 108. But even the king of all things competitive eating would be a bit daunted by a menu item at Mallie’s Sports Bar & Grill. The restaurant based in the Detroit suburb of Southgate recently cooked up an ogre of a burger, one that ended up weighing in at 1,774 pounds. 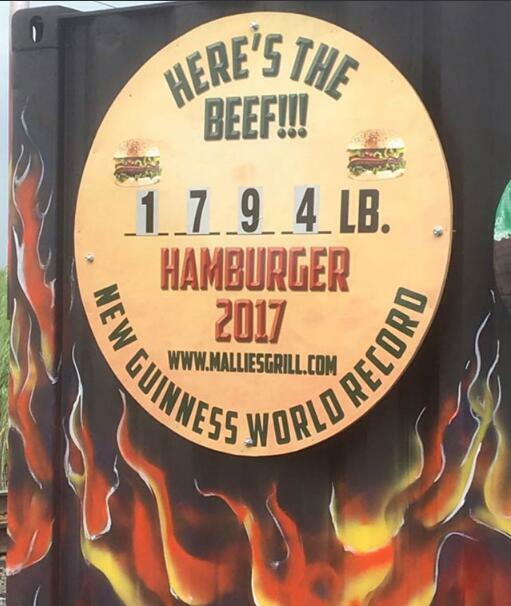 The far from bite-sized beefy monstrosity set the Guinness World Record for the largest commercially available burger. 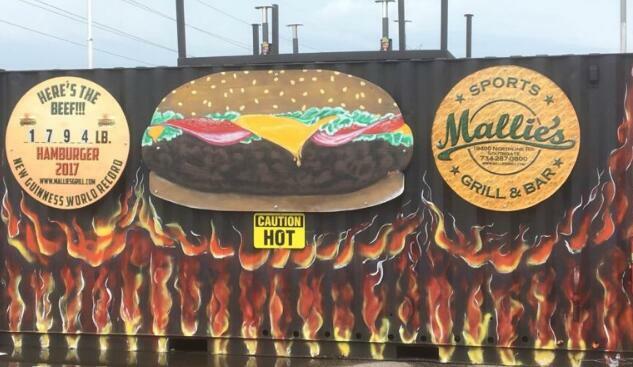 The burger started off as 2,000 pounds of ground beef, and then was cooked down to a lean 1,774, before having 300 pounds of onions, pickles, lettuce, and cheese piled, then wedged in between a 250-pound bun. To cook the thing, restaurant owner Steve Mallie had to custom-make an oven large enough to handle the hunk of meat. So, naturally, he fashioned one out of a shipping container with the dimensions to fit the five foot by three foot supreme slider. 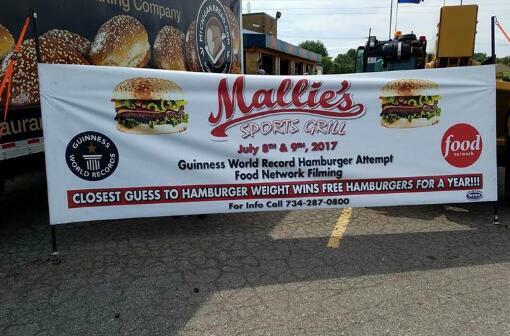 This isn’t the first time that Mallie’s has made it in the news for its gargantuan gastronomic feats; he first broke the record for world’s biggest burger in 2007, then again in 2009, 2010, and 2011. But those burgers were relatively puny in comparison, weighing in at 134, 164, 185, and 319 pounds, respectively. For those looking to take home the hulking hamburger, they’ll need to give the restaurant three days’ notice, $7,799, and will need to learn how to operate a forklift.